Abraham Burciaga is a Mexican street painter, born in Torreon. Since 2014, he has participated in festivals cities all over Mexico including Monterrey, Guadalajara, and Guanajuato. Burciaga has also made exhibitions in my own city of Torreon and Puebla. 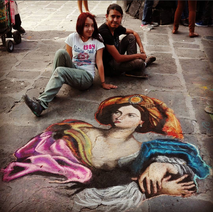 Recently, he was given the opportunity and honor showcase his chalk art skills outside of Mexico. A few of the places Burciaga has traveled to participate in chalk festivals include the USA, United Kingdom, and Germany. He has also made personal urban exhibitions in European cities such as London and Paris. One of his goals is to share all these experiences with young and professional artist of Torreon and increase the knowledge and awareness to this unique art festival in order to bring a chalk festival to Torreon one day.